"Well, we may not have parted on best o' terms. I realize certain words were exchanged. Also, certain... bullets." How far must a man travel to escape himself? Ever since the infamous Battle of Serenity, Malcolm Reynolds has had but one goal: to keep moving. In his Firefly-class spaceship Serenity, he travels the outskirts of civilization, taking jobs as they come and avoiding the Alliance. 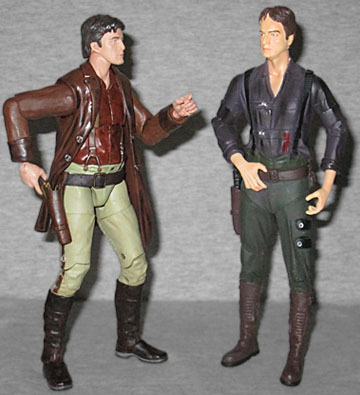 Mal's soldier ethics and fierce loyalty to his crew separate him from a petty thief. The Battle of Serenity Valley was basically the end of the Unification War - a small group was successfuly holding off the larger Alliance army, but rather than send reinforcements, the Independent High Command opted to surrender. This perceived betrayal shattered Mal, so now he surrounds himself with people who represent aspects of his character he can no longer admit to: humor, selfishness, innocence, spirituality, unrestricted compassion, etc. He's using his crew to rebuild his psyche. Although he was ultimately played by Nathan Fillion (at that point best known for his role on Two Guys, a Girl and a Pizza Place), the role of Captain Reynolds was written for Nicholas Brendan - but his commitment to BtVS meant the schedule conflicted and we got Fillion instead. The sculpt decently approximates the face your parents know as Richard Castle. 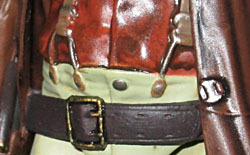 Unlike the two figures we've reviewed already, Cap'n Tightpants is wearing something he wore on the show. In addition to said pants (tan, with a dark brown stripe down the outside of both legs), he's got dark boots, a brick red shirt, and of course his brown coat. 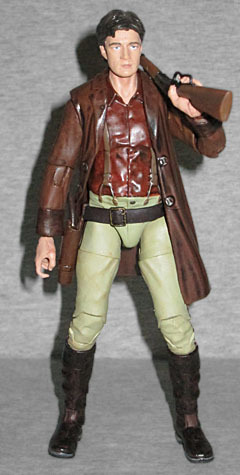 Which, oddly, is not the brown coat the Browncoats wore during the war, just a brown coat; the uniform version was closer in color to his pants than this jacket. 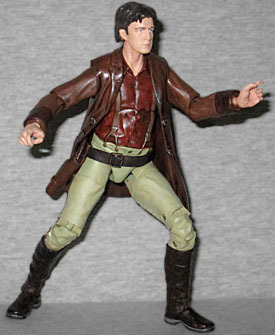 He's sculpted with his suspenders both front and back - hopefully that means Funko is planning a Series 2, and coatless Mal variant. 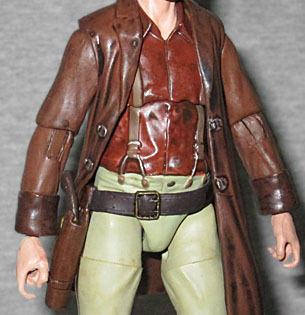 The sculpt is a little softer than you'd expect - at least, the wrinkles on his clothes seem less well-defined than we normally expect from the Legacy Collection figures. Even the buttons on his coat and shirt seem undetailed. Gotta go sharper! Mal moves at the neck, shoulders, elbows, wrists, torso, hips, thighs, knees and ankles. 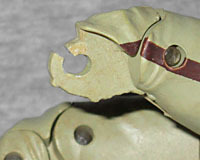 This is the first Firefly figure I've gotten that suffered from a broken joint: the left knee hinge split beneath the lower pin, but since I'm writing this review while waiting for a replacement, you can tell that it's not too terrible. The wrists don't fit into the forearms very tightly, so they almost act more like tiny balljoints than swivels. Still, I'd rather they did that than snap, you know? And it wasn't the clear plastic that broke. 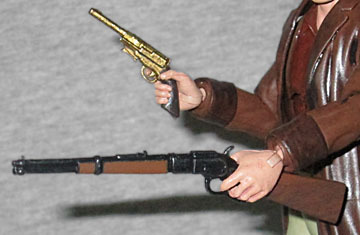 He comes with two guns: his standard sidearm, a "Moses Brothers Self-Defense Engine Frontier Model B" - which was really a Taurus Model 85 modified to look like a Civil War-era Volcanic Repeater - and a Winchester Model 1873 Carbine. Malcolm Reynolds with a shotgun? Imagine that! Both hands have the trigger finger extended, so he can hold whichever gun you want. The pistol also fits in the holster on his right hip. Surprisingly, this isn't the first time Mal has had an action figure: Diamond Select Toys made a small line when Serenity came out in 2005. As much as we love DST, those toys were hot garbage in every possible way, which is as politely and diplomatically as we can put it. This one is so much better that it's not even funny - even the worry about broken joints isn't enough to drag this one down to that level. It's amazing what a difference a decade can make.